Idaho officials have argued that the Affordable Care Act gives the state jurisdiction to allow plans that don't fully comply with the law's coverage mandates, and the Trump administration is walking a fine line on its messaging on the issue. Idaho's director of insurance, Dean Cameron, and GOP Gov. Butch Otter met with HHS Secretary Alex Azar and CMS Administrator Seema Verma over the weekend during the National Governors Association annual winter meeting. Cameron told Modern Healthcare he and the governor emphasized to the federal leaders that an ACA provision calling on states to "substantially enforce the law" could be the sticking point over whether noncompliant plans can be sold. "It will be left to Secretary Azar to show what 'substantially' means," Cameron said. One insurer is already planning on taking advantage of Idaho's newly proposed flexibility. Blue Cross of Idaho has proposed offering five noncompliant products on the exchanges, which Cameron said provide fairly robust coverage even if they do include annual coverage caps and carve out some services. He also noted that carriers have to offer compliant services as well. Azar and Verma listened "intently" to the state's arguments, Cameron said. "They are obviously caught in a situation where they have taken an oath to uphold the law, and we tried to show them we are enforcing the law," Cameron said. 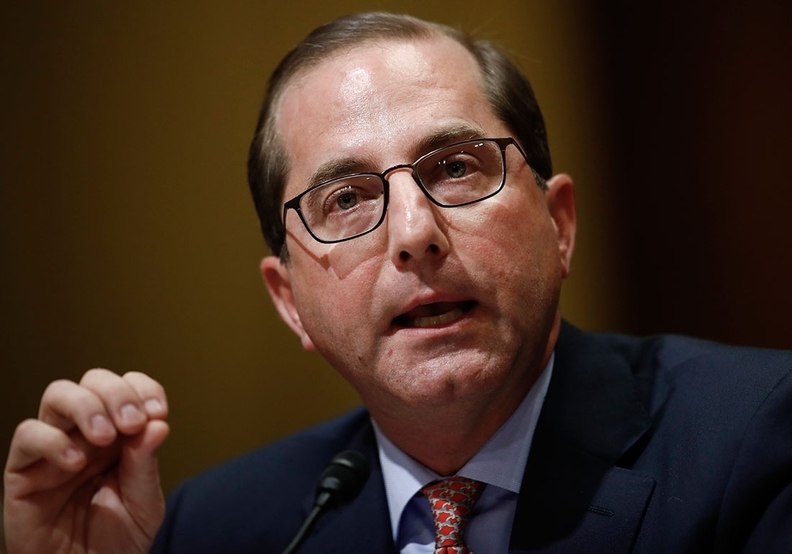 An HHS spokesperson said Azar and Verma responded by highlighting the recently proposed rule that extends short-term, limited-duration plans to a full year as a way to open up consumer choice. "HHS is committed to working with Idaho and all states to give them the flexibility, will enforce the law as needed, and looks forward to receiving comments from all states on the recently announced proposed regulation," the spokesperson said, adding that Azar and Verma "empathize with the challenges that states such as Idaho face with Obamacare." According to the proposed rule on short-term plans, people can re-apply for these policies. They would not be automatically renewed since they would have to face screenings for chronic and pre-existing conditions. Should enrollees pass these underwriting screens, they could hold the short-term plans for as long as they want, which critics say pits these plans directly against traditional insurance. Cameron emphasized to Modern Healthcare that Blue Cross of Idaho's noncompliant plan offerings are much more substantial than short-term, limited-duration plans. While they don't pose maximum lifetime limits, they do cap annual expenditures allowed per enrollee at $1 million. They also pose higher out-of-pocket costs for enrollees and some exclude coverage mandated by the ACA, such as maternity care. Health law expert Timothy Jost also warned that because the plans are subject to medical underwriting, enrollees might lose their coverage if they are diagnosed with an expensive chronic condition like cancer. Along with Otter's executive order that spurred the creation of these noncompliant plans, Idaho had also hoped to apply for a dual 1332-1115 waiver that would siphon high-cost patients to Medicaid as a high-risk pool and use the cost savings to help close the coverage gap for low-income Idahoans that resulted from the state's decision not to expand Medicaid. The waiver proposal proved controversial with ultra-conservative Republicans in the state Legislature, and on Tuesday the policymakers decided to spike the measure and send it back to committee. Idaho lawmakers have been trying to resolve the coverage gap issue for years.